Physalis. 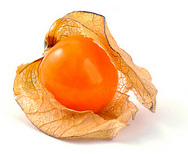 GROUND CHERRY; HUSK TOMATO. (From Greek physa, bladder or bellows, referring to the inflated calyx). Solanaceae. Some 80 species of annual or perennial herbs to 3m. Stems glabrous or pubescent, to 3cm diameter. Leaves linear to ovate, stipitate, alternate, opposite or in whorls of three, entire, margin undulate to pinnatifid. Flowers solitary, sessile, axillary, white tinged violet or yellow, often purple at maturity; calyx campanulate, 5-lobed, accrescent, becoming inflated in fruit; corolla campanulate to rotate, tube short, limb 5-lobed, plicate; stamens 5, attached to corolla tube; style filiform, stigma capitate. Fruit a sessile, globose berry, yellow to green, enclosed by calyx. Cosmopolitan, especially Americas. 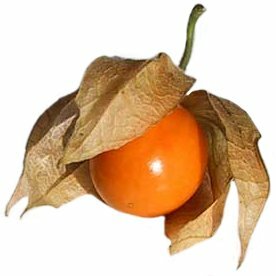 Grown for their fruit or for flowering display, Physalis alkekengi is used extensively for decoration, with inflated calyces that provide a vivid orange display in the autumn garden; these are also used for drying (cut stems when the calyces begin to colour, and air dry.) This and other species of similar habit tend to be rather invasive, and can be checked by spading out underground runners in autumn. 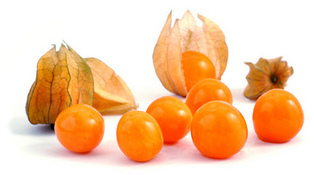 Physalis peruviana yields the dessert fruit known as the Cape gooseberry. It is not reliably hardy beyond areas that are frost-free or almost so, but in temperate zones can be grown for fruit in a cool glasshouse. Physalis ixocarpa, or tomatillo, an annual cultivated for its fairly large fruits, may be grown as for outdoor tomato. 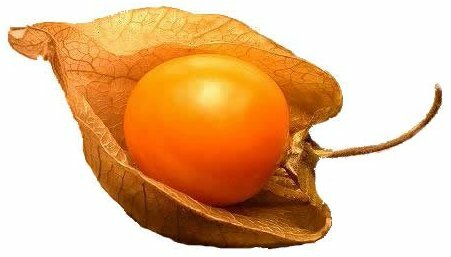 The husk tomato, Physalis pubescens, described by Parkinson in 1640 and grown by Philip Miller in the 1730’s, yields small, yellow, tomato-like fruits with a thin husk. All species are easily cultivated on any well-drained soil, in sun or light shade. Propagate annuals from seed, surface-sow in the cold frame in autumn, or in situ in spring. Divide perennials, or increase from seed. For the purposes of clarity only the species which are edible are featured below although these may also be decorative. CLAMMY GROUND CHERRY. Rhizomatous perrennial, densely glandular-pubescent, to 90cm. Stems and leaves sticky-pubescent. Leaves ovate, to 10cm, sinuate to dentate, base rounded to oblique; corolla to 2 x 2.5cm, yellow, frequently spotted purple; anthers blue, to 5mm. Fruit small, yellow, edible, surrounded by a green-brown calyx. Summer-autumn. SE US. Z8. CAPE GOOSEBERRY; PURPLE GROUND CHERRY. Perennial. Stems erect, pubescent, stout, to 1m. Leaves ovate to cordate, to 10 x 7cm, entire or undulate, dentate, apex acuminate, base cordate; petiole to 4cm. Flowers white; calyx to 1cm, becoming ovoid, pubescent, to 4cm, 5-lobed, persistent; corolla to 14 x 5mm, yellow, blotched brown or purple, 5-lobed, lobes blue-green, anthers 5, violet. Fruit globose, purple, to 2cm diameter. Summer. Tropical S America. ‘Giallo Grosso’ (‘Large Golden Italian’): fruit large. ‘Goldenberry’: fruit large, sweet. Z8. TOMATILLO; MILTOMATE; PURPLE GROUND CHERRY; JAMBERRY. Annual, subglabrous, to 60cm. Stems erect, branched. Leaves ovate to broadly lanceolate, 10 x 4cm, apex acuminate, base cuneate, margins entire or dentate at base; petiole to 5cm. Calyx to 1cm, lobes to 5mm, ovate, enlarging to 5cm, green, veined violet, occasionaly splitting; corolla to 3cm diameter, yellow, marked purple-brown; filaments violet. Fruit yellow to purple, edible. Mexico, naturalised eastern N America. ‘Purple de Milpa’: fruit small, purple tinged, sharp-flavoured, keeps well. Z7. STRAWBERRY TOMATO; DWARF CAPE GOOSEBERRY. Resembles Physalis peruviana but stems branching at base, leaves cordate, oblique, pinnately toothed. Annual, to 45cm. Stems viscid, bluntly angled. Leaves to 8cm, coarsely dentate. Flowers dull yellow, to 13mm. Fruit yellow, edible. Eastern N America. Z5. GROUND CHERRY; HUSK TOMATO; STRAWBERRY TOMATO; DOWNY GROUND CHERRY. Annual, villous. Stems erect, to 90cm, branched, ridged. Leaves ovate, to 11 x 7cm, dentate, teeth unequal, acute, apex acute, base cordate to truncate; petiole to 7cm. Calyx to 1cm, enlarging to 3cm, teeth to 5mm, narrow-lanceolate, green; corolla to 12mm diameter, yellow, blotched purple at throat; anthers purple, to 2mm. Fruit to 1.5cm, yellow. Summer-autumn. Americas. ‘Cossack Pineapple’: fruit small, yellow, pineapple-flavoured. ‘Goldie’: fruit medium-sized; plants well branched, decorative, prolific. Z7.